Happy March! It was a dark, cold rainy day here today and we only made it up to about 44 degrees. We are supposed to get a couple of 60 degree days this week and then a chance of another winter storm later in the week. Winter just doesn't want to let go. This evening only one of my sons came for dinner because the other one came for dinner last night instead since he had things he needed to do today. We ran our errands to Costco and did our grocery shopping this morning. 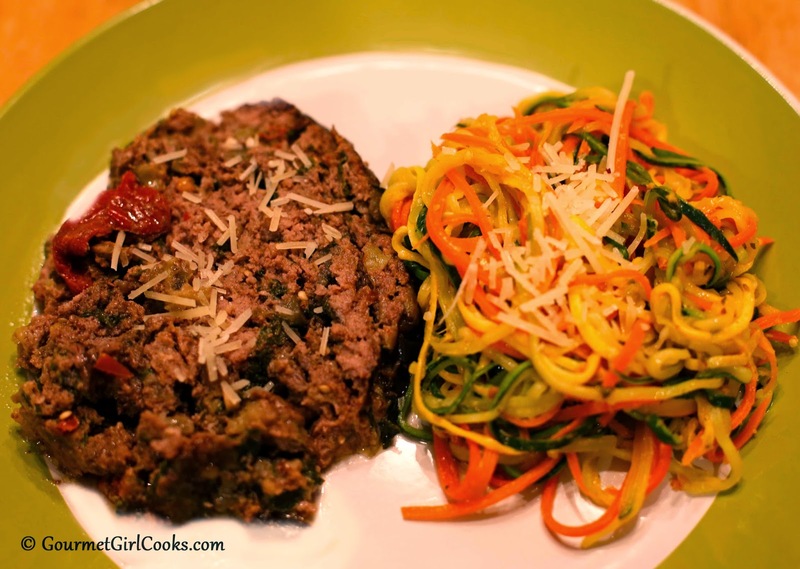 I picked up a 3-pack of organic ground beef at Costco so I could make meatloaf for dinner. My older son went skiing in North Carolina over the weekend so I'm sure he is ready for some warm comfort food! 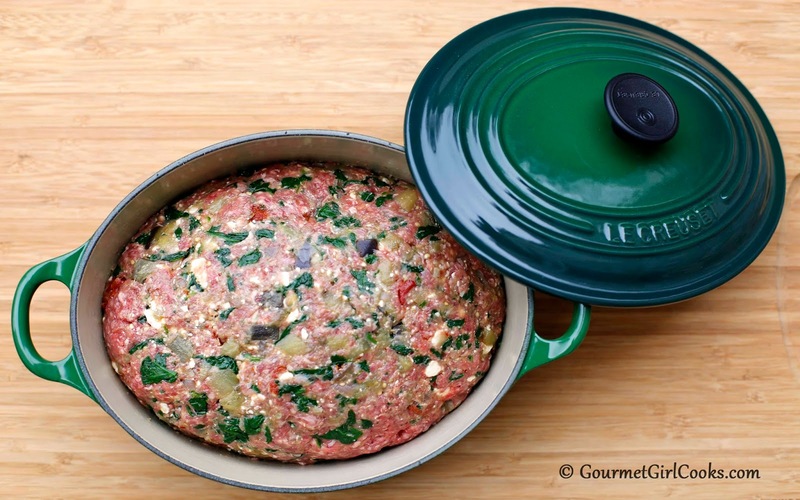 I decided to make a big Greek Style Meatloaf. 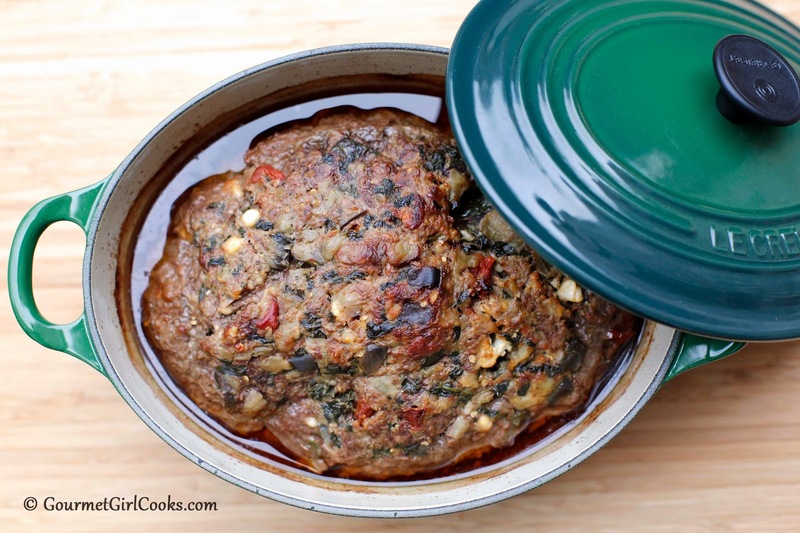 I've made one before (click here: Greek Style Meatloaf) that included chopped spinach and feta, but this evening I wanted to kick it up an extra notch. I actually diced up a small to medium sized eggplant and sauteed it with onions and fresh garlic until tender. I also lightly sauteed some fresh baby spinach and chopped it up. I combined the eggplant mixture, spinach, feta, Parmesan, Greek seasoning and some oven roasted tomatoes packed in oil with about 3 pounds of the lean ground beef. It smelled wonderful as it baked in the oven. If you don't care for eggplant, you can easily omit it. For the guys, I cooked and mashed some red skinned potatoes and also fixed baby peas and carrots to go along with their meatloaf. For my side dish, I used my little julienne peeler to make a tri-colored medley of zucchini, yellow squash and carrot; it's the perfect little gadget when only making one or two side dish servings. Everyone was happy. 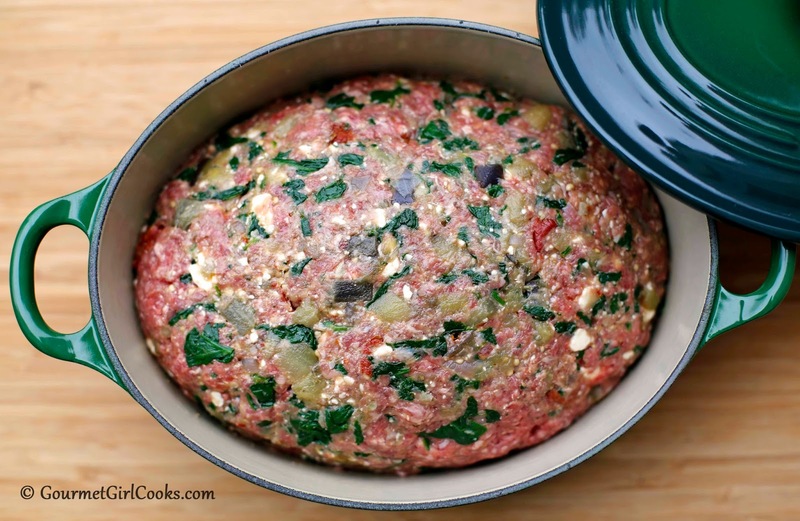 I snapped a few photos of my low carb Greek Style Meatloaf w/ Eggplant, Spinach & Feta below as well as included the easy recipe. Enjoy! 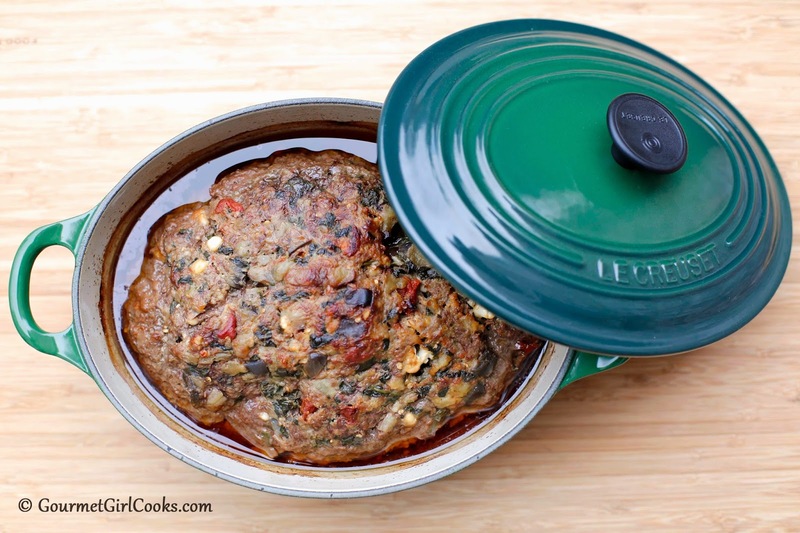 In a large skillet or pan with lid, heat 2 tablespoons olive oil over medium-high heat. Add onions and cook until beginning to soften, about 5 minutes. Add diced eggplant and additional olive oil, as needed. Saute for a few minutes, stirring frequently. Season with salt, to taste. Add water; cover and reduce heat to medium and cook eggplant until soft, about 5 to 7 minutes. Uncover and add minced garlic and cook uncovered until remaining liquid or moisture has evaporated and eggplant is tender, about 2 to 3 minutes. Set aside and let cool. 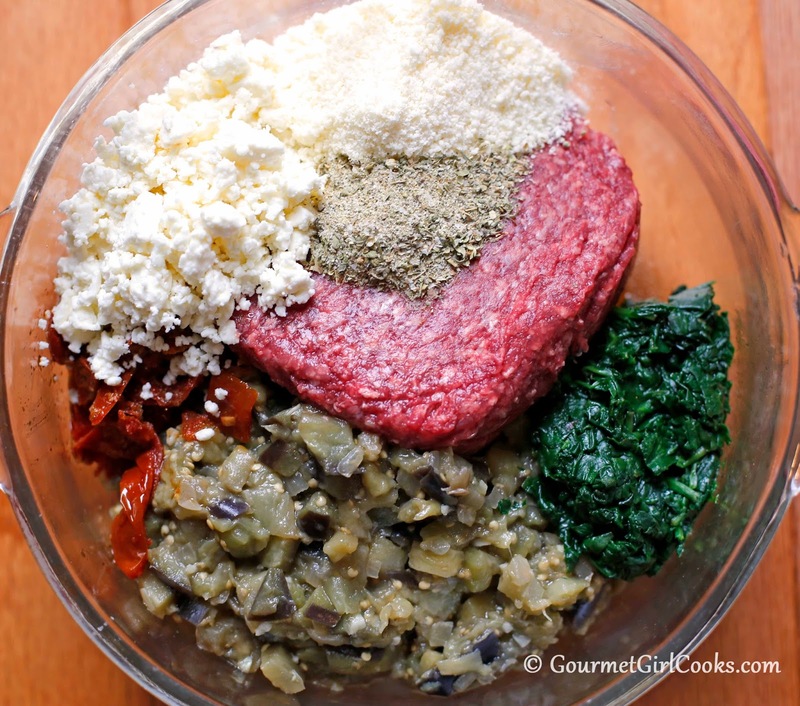 In a large bowl, combine ground beef, eggplant mixture, spinach, tomatoes, feta, Parmesan and Greek seasoning. Shape into an oblong loaf. Place in baking pan or casserole dish. Bake approximately 1 hour 15 minutes, or until done. Let sit for about 5 to 10 minutes before slicing. *Note: 2 to 3 tablespoons sun-dried tomatoes packed in oil can be substituted for the oven roasted tomatoes, if desired.